Cain Creek Outfitters is made up of Langbehn Land & Cattle Inc and several other leases. Langbehn L&C is an extensive farming & angus cattle ranch which through crp, cropping, conservation has brought huge numbers of pheasants onto their property. Our guiding and hunting pursuits over the years have brought us some of the very best land leases SD has to offer and we are now able to bring them to the hunters in one of the premier pheasant hunting lodges in South Dakota. We have 15 years of experience as a professional guiding operation. Growing up in this area, we know the land and have hunted the land for a very long time. 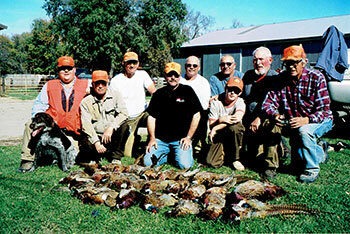 We will give you the best wild pheasant hunt South Dakota has to offer, with thousands of acres ready to get the job. The country in which Cain Creek Lodge is located is Beadle County and as always been a leader in wild pheasant population. This year is no exception as it looks to meet or top all previous records.